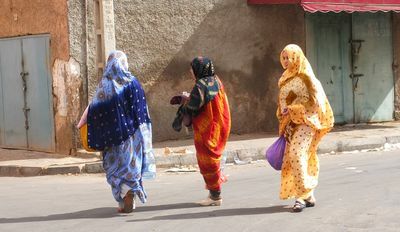 Inside the Western Sahara are the little-known Saharawis, where about 50,000 make up a tenth of the total population. Double that number is the amount of Moroccan security personnel - 100,000. Life is difficult there, with rife unemployment. Many of these people tell stories of being arrested and beaten during peaceful demonstrations. While those Saharawis arrested talk of humiliations, beatings and torture, others speak of relatives engaged in political activities and protests who have been imprisoned, allegedly on false charges. Many among the younger generation of Saharawis are getting increasingly frustrated with the lack of progress and the difficult life, and some are talking about reigniting the armed struggle against Morocco. 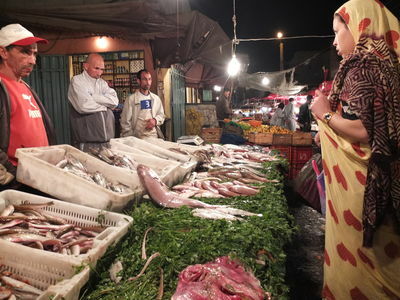 Saharawi woman buying fish at the main market in El Aaiun, capital of occupied Western Sahara. 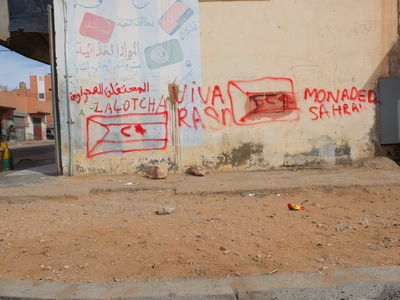 Saharawi grafitti on a wall in El Aaiun, Western Sahara. 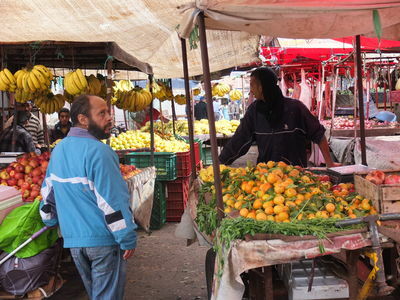 Salesmen on the main market in El Aaiun, Western Sahara.